This article is an opinion based on facts and is meant as infotainment. It is our fifth time ranking the most dangerous places to live in Maryland and is updated for 2019. Do you live in one of the most dangerous cities in Maryland? No one wants to feel unsafe, and statistically speaking, odds are that where you live is most likely relatively safe. In order to help the good people of Maryland — and anyone looking to move to Maryland — know just how close they are to danger, we took data from the annual FBI report and did some serious analysis. So what is the most dangerous city in Maryland? After analyzing 33 cities in Maryland, Ocean City takes the top spot as the most dangerous city in Maryland based on the most recent FBI data. Or learn more about the safest places in Maryland. Ocean City coming in as the 1st most dangerous place in Maryland might surprise some, as this resort city is a popular tourist destination. But this fact may explain the mind-bogglingly high 1 in 6.8 chance residents faced of being the victim of a property crime in 2017 and the 1 in 65 chance of being the victim of violence. 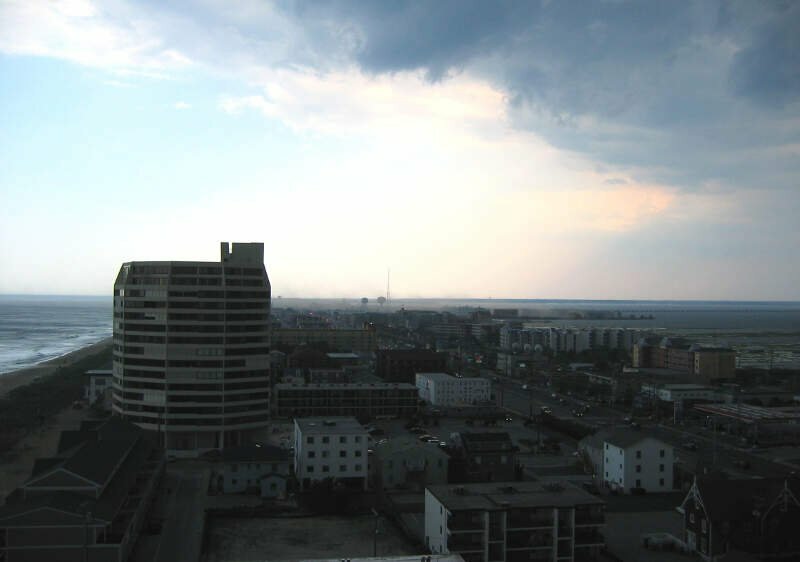 While it is true that “crime per capita” of people that live there is thrown off by the summer swell of population, the fact of the matter is that a ton of crime is committed in Ocean City relative to its resident population. 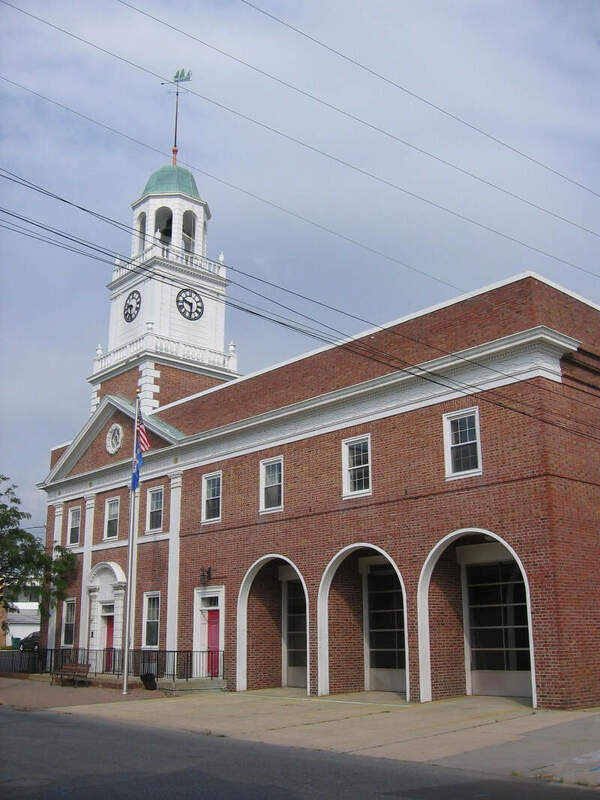 Cambridge is the fourth most populous city on Maryland’s eastern shore (behind Salisbury, Easton, and Elkton) and the 2nd most dangerous, ranking 3rd and 2nd in violent and property crime statistics. Residents of Cambridge faced a nearly 1% chance of being the victim of violence in 2017, which reflected a 23% drop from 2011. Property crime has also gone down in recent years, but not by nearly as much. Lived in Cambridge for years! Best little redneck town I have been too! Going to the wal mart was awesome you could stay there for hours people watching and never get bored!! Ah Baltimore — you were probably expecting this to top the list as the most dangerous city in Maryland, and you’d be right in terms of violence. After all, you don’t earn a nickname like Bodymore, Murderland for nothing — there were 342 murders committed in 2017. To put that in perspective, if Baltimore had the population of New York City, there’d be 3,141 murders a year, and over 110,000 instances of violent crime. I used to visit Baltimore frequently, but will now not visit due to crime. it is no longer same to take my family there to see the sights, watch a team play, or visit the Inner Harbor. The crime and packs of kids running around causing trouble are the primary reason I no longer visit the city. 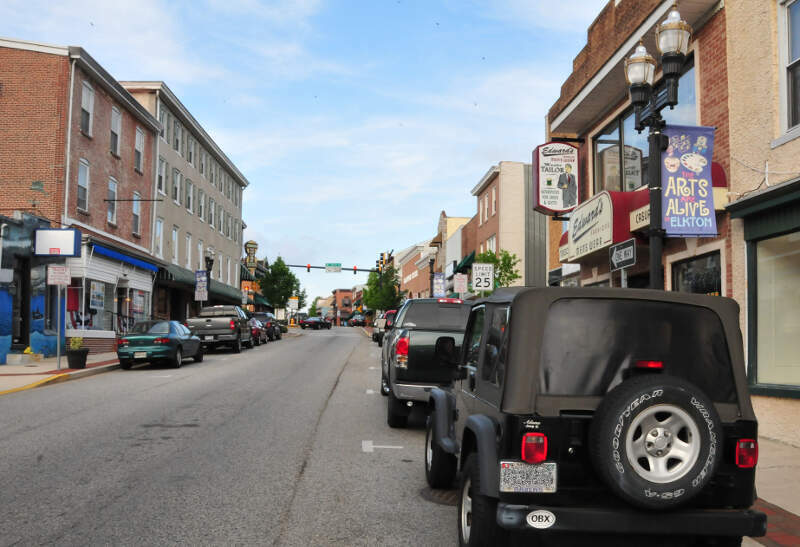 Located on the northeastern shore of Maryland, Elkton isn’t the worst city in either property or violent crime, but placing 4th and 4th respectively earns the city its 4th place ranking on this list. Residents of Elkton faced a 1 in 85 chance of being the victim of violence, and a 1 in 16.2 chance of being the victim of theft or arson in 2017. The amazing thing is that these numbers reflect a 38% drop in violent crime and a 19% drop in property crime from 2011. Located in the western part of the state, the Cumberland Metro area is among the poorest in the U.S. in terms of per capita income. That may be related to its high levels of both property and violent crime, with residents facing 1 in 16.0 chance of being the victim of theft or arson each year. Only very small improvements were made between 2015-17, with about a 5% decrease in each category of crime. 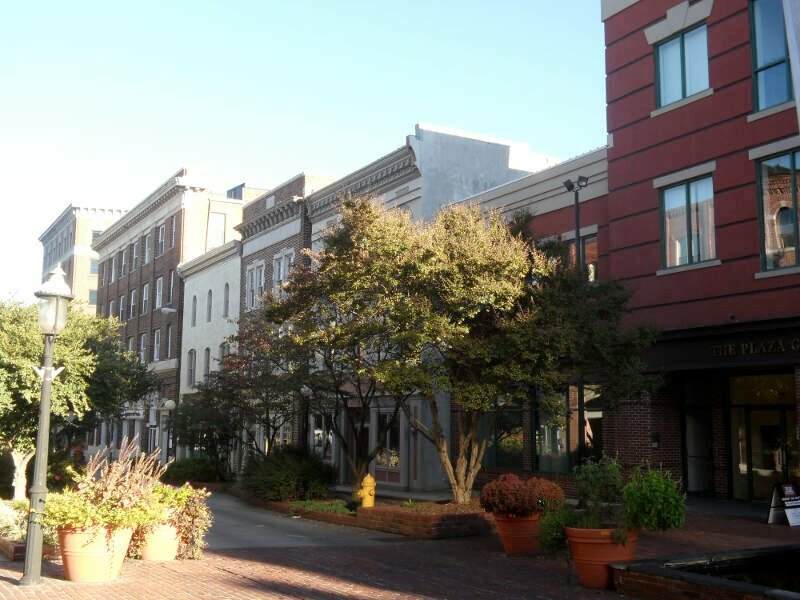 Located in southeastern Maryland on the Delmarva Peninsula, Salisbury isn’t as violent as the above cities, but residents still face a 1 in 102 chance of being the victim of violence. That’s still 36% less violent than Baltimore, but that’s hardly a high standard to hold a city to. The good news is that violent crime dropped by a modest 13% between 2015-17, while Baltimore’s wickedly high rate of violence has remained stagnant in recent years. I moved to salisbury from central nj a few years ago, man what a step down that was. I’ve been called a cracker and a homeboy. I used to work for dish, so I went into a lot of customers homes. That job really opened my eyes to how people live down here. I had a customer come home from jail whole doing work and he proceeded to smoke crack with his family. This place is disgusting, if it weren’t for my gfs great job, we would have moved by now. 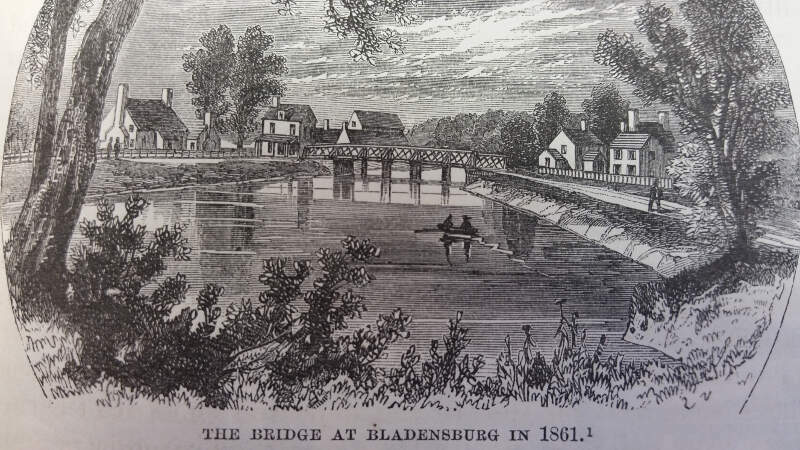 Located 9 miles from central Washington, D.C., Bladensburg is the 7th most dangerous city in Maryland. With residents facing a 1 in 127 chance of being the victim of violence in 2017, Bladensburg is the most violent of the D.C. suburbs that make up several spots on our list of the most dangerous places in Maryland. If you live in Laurel, you already know which parts of town to avoid. But did you know you have a 1 in 163 chance of being raped, attacked or outright killed every year? Those are the stats. Plus, 1 in 28.0 people has their lives screwed up due to a property crime of some sort. Odds are if you’ve lived in Laurel for a long time, you’ve been robbed at least one time in your life. If you pass through Laurel, lock your doors. And don’t talk to strangers. Just 6 miles east of DC, Hyattsville is the least violent of the D.C. suburbs, and the least violent place on this list overall. That’s partially due to a massive 47% drop in violent crime between 2015-17, as well as a 17% drop in property crime. Still, Hyattsville residents had a 1 in 18.2 chance of being the victim of theft or arson in 2017. 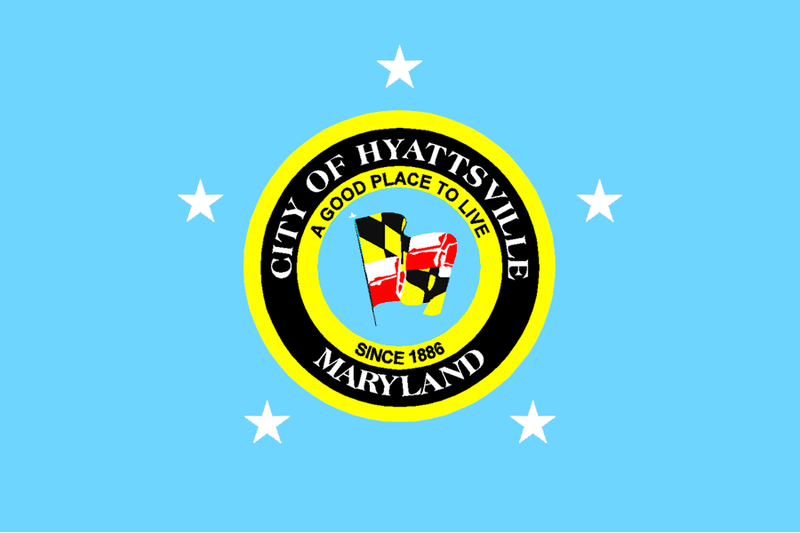 As a resident of Hyattsville for over a decade, I’m prone to say that your factfinders don’t know what they are talking about. Silver Spring and College Park are continuously within walking distance and, in contrast to Baltimore, everybody gets along here. 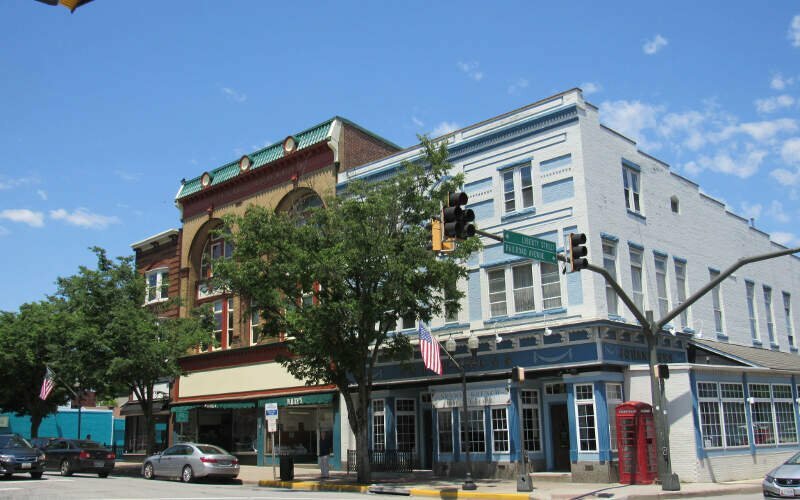 Located in northern Maryland, about 35 miles northwest of Baltimore, Westminster is about 3 times as safe a Baltimore in terms of violence. Still, the 1 in 22 chance of being the victim of a property crime in 2017 represented a 19% rise from 2011. Westminster is far from the most dangerous place in Maryland, but it’s relatively bad scores in both categories earn it the last place on this list. 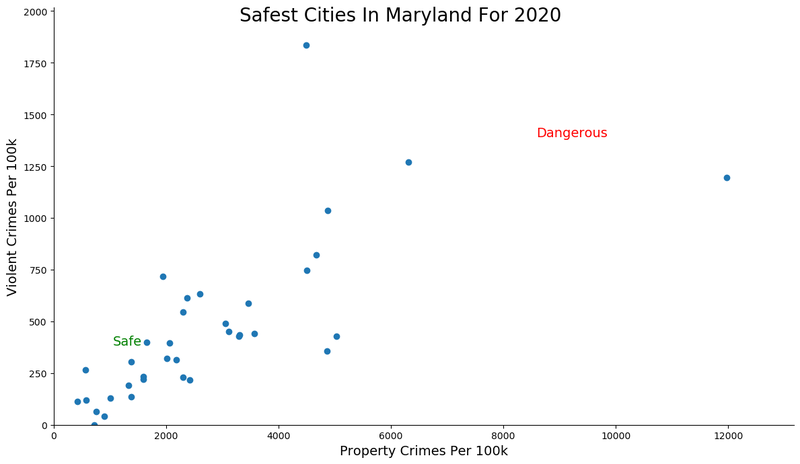 How we determined the most dangerous cities in Maryland for 2019? In order to make the analysis as apples to apples as possible, we only considered cities over 5,000 in population. That left us with 33 cities in Maryland. We then ranked each city from 1 to 33 for the two criteria with a #1 ranking being the most dangerous for the particular criteria. Finally, we ranked every city on the “Dangerous Index” with the lowest index being the most dangerous in Maryland — Ocean City. Read on for a detailed look at the 10 most dangerous cities in Maryland. The latest FBI crime data shows that Ocean City ranks as the most dangerous city in Maryland for 2019. We want to point out again that there’s still safes places in Ocean City and that this isn’t a comment on the people that live there. So please don’t beat us up. Where Are The Most Dangerous Cities In Maryland? Laurel is not in the west part of the state and has never been the capital of Maryland. 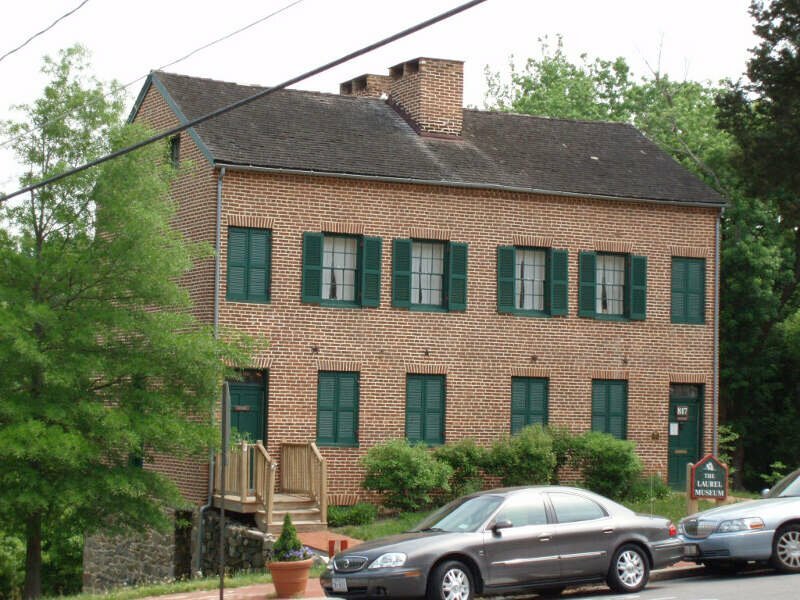 Annapolis is the capital and briefly was the Capitol of the United States.